It doesn’t matter how decisive you are if your team doesn’t grab the rope and pull. Worse yet, they might support you when you’re in the room, but drop the rope in disapproval when you’re gone. 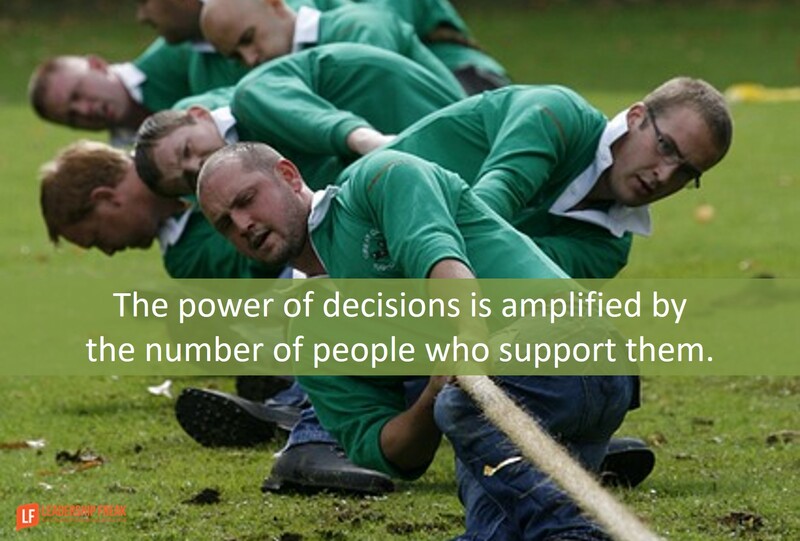 The power of decisions is amplified by the number of people who support them. People who feel left out, pull out. Engage others early and often. Successful leaders distinguish between making decisions and the decision-making process. Even if you’re making the final decision, include others in the decision-making process. Confirmation bias makes a rush to decision-making dangerous. In other words, once you’ve made a decision, you defend it, even if it’s a bad one. Seek input – withhold judgement. Explore ways suggestions might work. Ask, ‘What brought this to mind?” When you hear a surprising perspective. What does this look like from the front-line? Forget your title. Titles give inexperienced leaders the feeling that they’re smart when they’re dumb. Keep your learning-hat on longer. Approach important decisions as a learner first and decision-maker second. Answer ‘why’ and ‘what’ before digging into ‘how’. Why does this matter? Answer ‘why’ before determining ‘what’. What’s going to be better? How will things be better? Who is impacted? How should they be involved? Engage people in gathering data. After making a decision, set a future date to explore what you have learned and where you might adapt. What causes lack of support for decisions? How might leaders make decisions others support? Good post. As my Dad used to say “People tend to be down on what they’re not up on.” Would love to see a post on socializing ideas upward–getting senior buy-in to a change agenda. Thanks Dan. Love your blog! Let’s send Brian Moore our spreadsheet tomorrow to begin orders for Journalism. I”ll finish my edits today. Of Square Wheels always thumpy. When communications aren’t so lumpy. Involvement and engagement and continuous continuous improvement all revolve around asking for ideas, fleshing those out as you outline, and then also creating ownership. Having a few spins of success and trust and support also help build things. One other idea to deal with confirmational bias is to have that appointed “Devil’s Advocate” person whose responsibility it is to look at things from alternative angles. Have fun out there! Success breeds success. That comment above may not read correctly…it is meant to illustrate ‘fake’ collaboration and a habit of doing business outside the regular meeting, with just a couple allies in the group. That’s a great way to get people to “pull out”. What causes lack of support for decisions? Where I work, sometimes there is an agenda against the management group. Union vs. non-union. Old vs. young, etc… Sometimes, people don’t want to support a decision simply because they don’t like you and see you as a threat to their way of life. How can a leader make decisions others support? – Begin with the end in mind and pick the right team. Make sure the affected individuals have the right mindset and are culturally in tune with the goals of the organization. When we hire folks I often tell my managers to hire entry level employees based on character rather than experience. We can teach them the job, much harder to teach them “positive attitude”. Pretty soon as the workforce turns over, the voice of the positive folks drowns out the negative. The negative will either get on the bus or move on. Good tips for the decision making process and engage others in the process prior to make any decision, nice article. In my experience many “title” leaders will not ask Why because reveals whether the team and organization is operating congruent with their values. The “get er done” leaders like to hear what’s being done and many times not why there are being done. The process to ask questions requires the person to operate in the space of a fascilitator and curious. I love to hear responses and see the wheels turning with the goal to increase awareness and performance. Questions help team members Create It, Understand It, and Own It. Take a fist full of 30 one dollar bills and ask for 30 reasons/how we can do this.